The NHL playoff picture is coming into focus, and teams are fighting for the last spots and top seeds. Who will lock down their division? Who will capture a wild card berth? It’s all decided in the last month of the season! 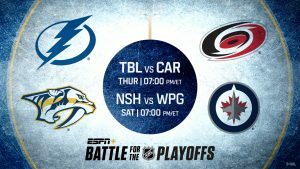 Stream the biggest games of the regular season on ESPN+. That’s over 40 games in March, including In The Crease with Linda Cohn and Barry Melrose, plus live sports like UFC, MLS, MLB and more for only $4.99 a month or $49.99 a year. While there are plenty of rumors abound about potential trade candidates, the New York Rangers may opt to wait before they make any trades, according to TSN’s Darren Dreger, who appeared on NBCSN’s post-game show on Wednesday. While there are rumors that the Rangers could move center Kevin Hayes whenever they want and might consider moving him soon, Dreger said that was unlikely and he can’t picture the Rangers moving Hayes or Mats Zuccarello until after the new year. The 26-year-old Hayes, who is eligible to be an unrestricted free agent next summer, has three goals and 11 points in 17 games so far this season. While he is still young, there are many among the Rangers’ brass who aren’t sure they want Hayes to be the center-point of their rebuilt franchise and might be better off moving him for more pieces. Zuccarello is also in the final year of a four-year deal and can also be a free agent. The 31-year-old has three goals and 10 points in 15 games. Even though Columbus Blue Jackets forward Anthony Duclair has been impressive this season with seven goals in his first 17 games as he’s currently on pace for a 35-goal season at a minimum $650K. However, many were shocked when Duclair found himself benched during the third period and overtime Saturday, according to The Athletic’s Tom Reed (subscription required). Head coach John Tortorella made his point quite clear. “He’s got to check,” Tortorella said. “He’s got to learn to check.” Of course, Tortorella put the blame on Duclair’s entire line, including Alexander Wennberg and Oliver Bjorkstrand. However, it was Duclair’s minutes that were cut into as he played just 5:40, although strangely, he was still given an opportunity to take a shootout attempt at the end of the game. Michael Smith of NHL.com reports that Carolina Hurricanes defenseman Brett Pesce did not practice Sunday after taking a knee-to-knee hit during Saturday’s game against Detroit and is listed as day-to-day. Pesce, who is in the first year of a six-year, $24.2MM deal ($4.03MM AAV), has been mentioned in potential trade rumors with the Toronto Maple Leafs in a potential William Nylander trade. The 23-year-old could provide Toronto with a cheap, young defensive-minded blueliner who could stabilize any teams’ defense. With the Toronto Maple Leafs enduring their drawn-out negotiations with restricted free agent William Nylander, it was suggested recently that Toronto try to negotiate deals with future restricted free agents, Auston Matthews and Mitch Marner, during the season to avoid similar holdouts next season. 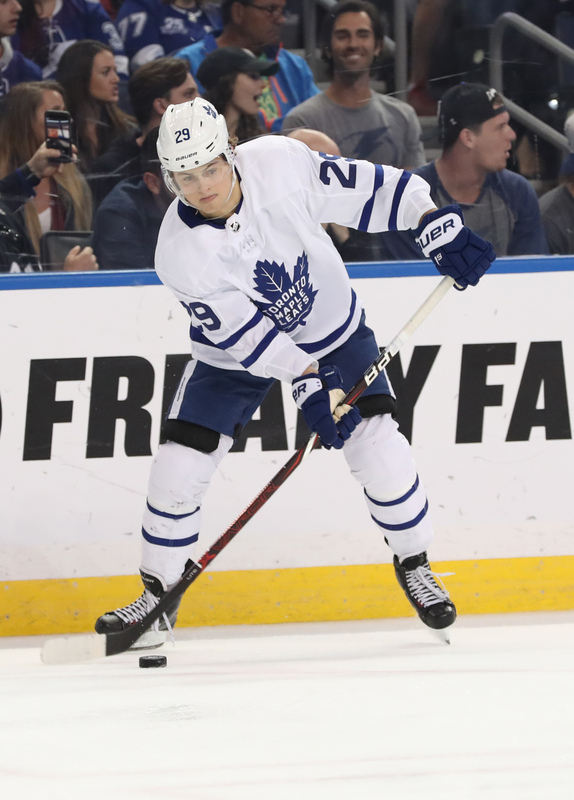 Sportsnet’s Chris Johnston on Saturday Headlines, reported that while Marner’s camp sounds uninterested in discussing a contract extension in-season, Matthews camp is open to a deal. Matthews would be in line for a major contract pay raise as he is likely looking for pay that may even exceed the $11MM that Tavares received this summer. The 21-year-old posted 40 goals in his rookie campaign. That number dropped a little last year when he tallied 34 goals, but Matthews also missed 20 games due to injury last season. 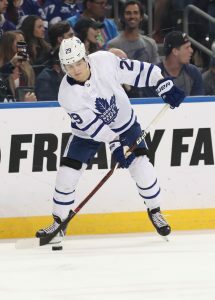 Marner, on the other hand, hopes to get similar money to that of Matthews and The Athletic’s James Mirtle (subscription required) believes that Marner is ready to take his game to another level and believes he will easily manage to average a point-per-game after impressing in Saturday evening’s game against Ottawa. If he has an 80-point season, Marner will have posted 210 points in his three entry-level seasons, which the scribe compares to numbers of Jack Eichel, who signed an eight-year, $80MM ($10MM AAV) deal a year ago. That could prove to be quite costly for the Maple Leafs as well. In a competitive defensive training camp battle, the Toronto Maple Leafs determined that defenseman Igor Ozhiganov was a keeper earlier than most. However, what does Toronto have in the 25-year-old defender who came over from the KHL this summer. The Athletic’s Ian Tulloch (subscription required) breaks down the play of the 6-foot-2 defender, who moves the puck extremely well, although there remain questions on his defense. While many KHL imports have struggled with moving the puck, Ozhiganov has had quite a bit of success so far, albeit in limited time, giving hope that he could develop into a solid blueliner. However, he does have Justin Holl breathing down his neck as a potential replacement. NBC Sports’ Joe Haggerty, in a mailbag piece, writes that Lee Stempniak, who signed a PTO with the Boston Bruins, continues to remain with the team hoping for a chance to work his way into the team’s lineup. The scribe writes that if youngsters Ryan Donato or Danton Heinen fail to impress in their top-six auditions, the team is keeping Stempniak around as insurance. The 35-year-old, who played 37 games for Carolina last season, said that he would prefer to stay in Boston with his family and will continue to practice with the team for now. The Florida Panthers are a trendy pick to make a run at the Stanley Cup playoffs this year, but have started camp off on a sour note. Jamie McGinn has undergone back surgery and will be out indefinitely. McGinn, 30, was a nice surprise for the Panthers last season after acquiring him from the Arizona Coyotes. The return for Jason Demers, who was shipped to the desert due to his heft cap hit, McGinn ended up scoring 13 goals and 29 points while continuing his physical brand of hockey. Though he’s certainly not a top line option for the team, he did provide some nice depth on the wing and could fill in higher up when injuries happened. The Panthers are considerably deeper up front this season after acquiring Mike Hoffman, Troy Brouwer and Frank Vatrano to round out their forward group and even expect younger players like Henrik Borgstrom and Owen Tippett to make an impact before long. That depth will allow them to deal with an injury to McGinn without much problem, but it does put pressure on the veteran upon his return. McGinn is in the final season of his current contract and hasn’t been able to match the 22-goal campaign that earned him $10MM over three years. If he wants anything close to that $3.33MM salary going forward he’ll have to get back to full health and start contributing right away.